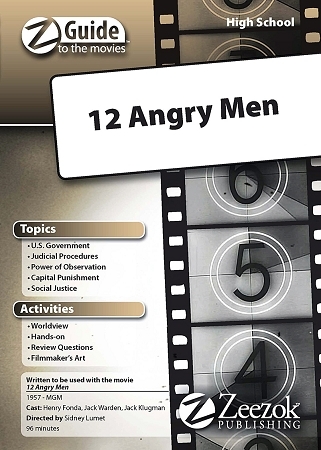 Zeezok Publishing's Z-Guide to 12 Angry Men is a great way to incorporate media into your study on U.S. Government and Judicial Procedures. This guide contains a topic overview movie synopsis and ten learning activities for an in-depth study of the film. Be the courtroom artist that sketches the defendants picture for the local newspapers. Learn more about the American judicial system and courtroom procedures. Sift through the evidence before reaching your personal verdict and hone your observation skills by compiling a dossier on the twelve jury members. Evaluate your own beliefs with the Worldview Activity probe the directors mind with The Filmmakers Art activity and get the entire family involved with the For Family Discussion section at the end of the guide. Choose those activities which best fit your students course objectives areas of interest or time schedule. Did the young man murder his father? You decide with the help of the 12 Angry Men . Movie Summary: Twelve angry men must decide the fate of an 18-year-old defendant accused of killing his father. Unable to get the fan to work on a hot New York afternoon the men nevertheless sit down to what they expect to be a short meeting. Tempers flare in the jury deliberation room as a lone holdout delays the inevitable. The prosecution seems to have a strong case but will the jury come back with a guilty verdict? This Z-Guide is based on the movie Twelve Angry Men (1957). You can view a trailer for the movie below.